Wheeling with excitment: Son Tra peninsula is a popular location for bike riders, with roads zigzagging up the mountain to nearly 700m above sea level. The tour, which was introduced last year, is one of the latest tourism offerings to showcase the city's diverse range of attractions. Le Viet Nam, managing director of Hoang Long Yen tours, says visitors can cruise at night along the Han River or go fishing at night off the coast of the Son Tra peninsula. "We design and decorate wooden boats from 10 to 30 seats with different options at night. They can even order a night party on board in summer. However, fishing tours can make the trip longer when we dock at rocks off the Son Tra peninsula coast or Ngoc islet near the Hai Van Pass," says Nam. A fleet of wooden boats will cruise from Bach Dang wharf, carrying passengers under the Han, Thuan Phuoc, Rong and Tran Thi Ly bridges and back within 60 minutes. All bridges crossing the Han River, which are illuminated by artistic LED lights, create a serene portrait of a city at night. Tourists can tour the award-winning Rong bridge in the shape of a dragon and witness it spit fire on Saturday and Sunday nights. Visitors can also indulge in a night time seafood party or an onboard BBQ serenaded by a local guitar band. Zipping along: A tourist rides a 50m long zip line down to the beach. The zip line also allows tourists to make a 5m jump down to the water. Traveller Tran Thanh says the Son Tra peninsula is a favourite location for bike riders, featuring mountains with zigzagging roads up to nearly 700m above sea level in a cool of forest and jungles. "The coastline along My Khe and Son Tra beaches as well as the pagodas built on the side of mountain are very beautiful. It's very fulfilling when you climb up to the top of the mountain and then ride downhill," he says. Thanh says his group often books summer bicycle tours in the area. "You have a lot of freedom with bicycles. You can bike and then go down to the beach by foot and sun bath in the tranquil sea at the foot of Son Tra Mountain," he describes, adding that motorbikes are also available. Nguyen Van Tuan says he prefers venturing through the mountains in vintage jeeps. Luckily for him, tour operators in the central city offer a range of 1960's jeeps for the more avid adventurers. "We design a longer route for jeep tours so tourists can visit more than one destination in Da Nang, Hoi An and Hue city," says Le Van Hiep, a tour operator in Da Nang. "There are many collectors of the US-made military jeeps in Hoi An and Da Nang. They also provide vehicles for tourists travelling a long road from Hue to Hoi An via Da Nang," says Hiep. Tuan says he relishes the time he spent driving a jeep along coast line between Da Nang and Hoi An. "It's an open air car. You can feel the ocean air when driving along beach and going up to the top of mountain or bending in zigzag mountain roads of the Son Tra or the Hai Van Pass," Tuan said. "You can order a set menu for meals with the car so you can have a party on the beach or at the top of mountain," he said. The Golden Sand, situated north of the Son Tra peninsula, is accessible by foot or cruise. It's an ideal location for adventurers wanting to camp for the night or stay in bungalows on the 10ha eco-tour site. 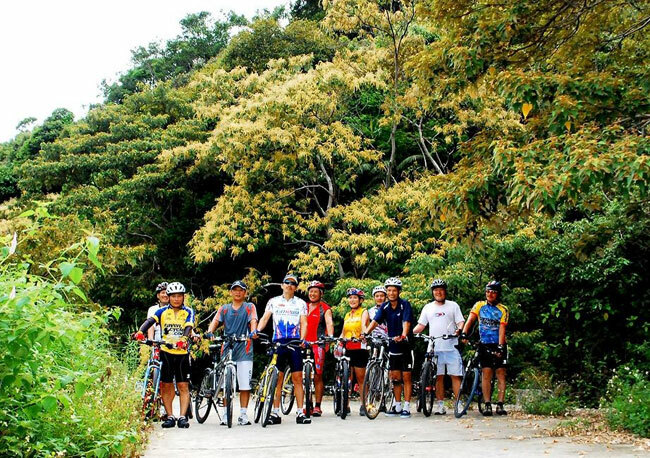 Trippers can venture to the top of the Son Tra peninsula by motorbike, bicycle or jeep. A dirty path, which connects the mountain to the Golden Sand, can be seen 300m above sea level. "Golden Sand eco-tour is our favourite option. 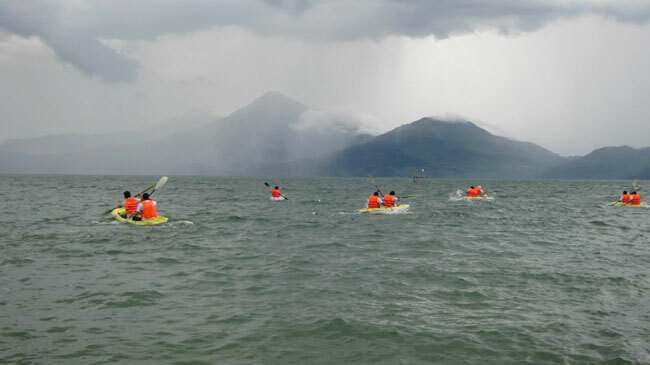 Visitors can engage in a range of activities including trekking, coracle paddling, kayaking and fishing," Nam says, adding the best weather is between April and August. A white long beach, sandwiched between the rocks, is a rendezvous point for outdoor team building in the sun and exploring the coral reefs. 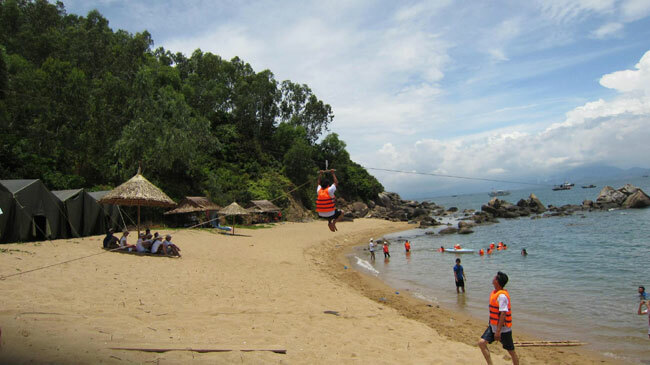 A 50m long zip line also allows tourists to make a 5m jump down to the water. "Tourists can taste the fresh air and experience nature in the Son Tra Natural Reserve. The cool air year round provides a relaxing environment for trippers," said Huong Ly, a tour operator. "The quiet, peaceful and untouched environment are good for summer holidays," she said. The fishing tour starts late at around 9pm and takes a 40-minute run to Hai Van Pass before docking at the Ngoc Islet. "Budding fishermen can drop their line in untouched tropical coral reefs. A lighting system from the boat also helps to lure groupers and red snappers. They can even cook or grill fish on board," said Nguyen Trung Kien, a guide from the Son Tra tourism management board. "The rock islet also preserves colourful coral reefs, where tourists can go snorkeling or diving with oxygen marks. The tour is only VND500,000 (US$24) per person for a group of 10," he said. Tran Thi Thu Trang, a tourist from Ha Noi says: "We enjoyed fun activities. We love the sea, the beach and hunting for snails and oysters in rocks."